ARCHIVE: Just spotted my old collegues Matt Locke and Frank Boyd launching another series of 360 lab initiatives at the BBC. 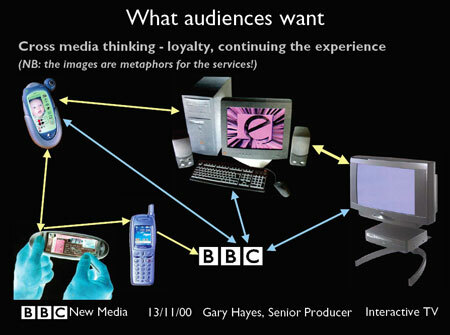 Not much has changed since the labs of 2000 and earlier, when EXACTLY to the day, six years ago I was presenting slides including those on this post to wannabee cross-media BBC producers. Incidentally I have put a selection of my old and new presentations up as a permanent, growing page here if you get the urge. Think it is important to look back on ones crystal ball gazing to constantly hone future predictive media skills. But back to the cross-media multi-platform conundrum. There are many problems in creating great, audience engulfing services across a sea of devices and these are not going to go away. As I have found out with hundreds of projects I have been involved in, we are on constantly shifting sands as new converged devices, distribution channels and changing audience numbers mean producers have to constantly be on their toes – part storyteller, part trend analyst, part risk taker. I have avoided statistics in this post, but we can take it as read that audiences are constantly fragmenting and using more and more media forms across more and more platforms. Much of the below is based on real world services to real audiences but the lab environments I am involved in are also good (especially LAMP 😉 not necessarily for what comes out of them but for the way it transforms producers – and I get to see their on-going concerns and their future ‘approach’Â to dispersed, interconnected and distributed service creation. What follows below is a draft’ish diatribe of cross-media thinking prompted also because I am speaking at a couple of conferences in the next couple of weeks (SPAA and ACMA) on the subject of 360 storytelling and viewer platform trends and with this and my leadership of LAMP I thought I would try to put keyboard-to-blog page and capture some thoughts, concepts and techniques. This helps me too, so note to me! “bathing the audience in a sea of your original inextricably linked content across continents of devices, letting them find their own path to live their own story”. My own foray into cross-media began probably when I was creating, producing and promoting music in the heady Manchester music scene of the 80s. There was nothing black art about doing radio interviews that navigated listeners to a concert or magazines and posters that promoted a record release or the main tryptych of radio to record release to gig (where the record store had a poster of the gig). Of course this was in the days pre-web and mobile phone but there was many and various initiatives that allowed you to preview music on landline telephone calls for example, or the old fashioned in-store promotion kiosks. When I joined the BBC in 95 the web was in its early days but already TV was promoting the BBC Networking Club in various late night ads. The BBCNC was effectively an ISP and at that point offerred people free internet accounts. Over the years that followed 95-04 I was part of the revolution as the tables were turned and the internet moved from being a partially referred adjunct to in 04 many shows needing to be promoted ‘from’ the internet. We are still at this tipping point and as such anything conceived now will only be a transitional service -Â beware those who say they know the future of the cross-media. The first real audience centric cross-media I produced at the BBC was in 97. A netumentary project in Central Asia which was live creation of world and local radio, a 40 day long story website with audio and photos, TV doc filming, daily viewer interaction as well as casual sound games. It was a lesson in making lots of rich-media in real time, which was good training for later on in interactive TV production. I also spent several years leading early thinking in BBC cross-media navigation (which I have referred to in posts before), which was at least seven years before its time! Alongside the two powerhouses of web and TV there was a slow fragmentation of audiences across a growing range of life devices. I call them life devices because most of the cross-platform revolution came about as consumers took control over when, where and how they get their media. I was lucky to be part of the global thinking about on-demand as well (my tenure as TV-Anytime Business/Audience Model Chair) and the move to content on demand onto portable, IPTV and TV PVR devices when combined with mobile phones and thrown in with TV and web well – things got complicated for producers. 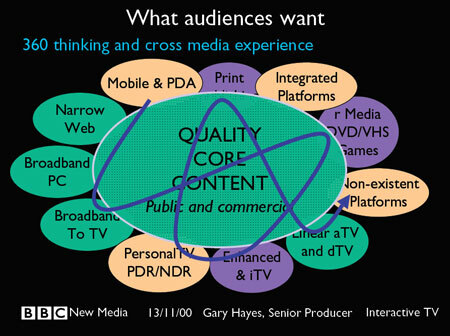 I deliberately put these slides from over six years ago not just because it was part of the first wave of BBC 360, Strategic Compass thinking, but to reinforce the point that no cross-media strategy or theory beyond generalistic audience media consumption habits will persist. Before we look at specific services, which I will add on tomorrow, one of the first key problems of real world cross-media production is and I quote the oft phrase “where is all the content going to come from? We have just enough resources to do the main show! It is easy for non-producer types to say you have a mobile bit here, a website there, some TV over there and a bunch of blogs here, and even if you can do it cheaply there is still the problem of the time and people resources. If the cross-media element is heavily linked to a TV property as it so often is, the real problem comes from ‘diverting’ the producers from making their oh so important show, which must go on. I have heard this so many times. The BBC was quick to devolve New Media creation back into production. A few other broadcasters have done likewise, just, but for the most part cross-media is a team of ‘webbies’ beavering away grateful for any morsel the TV or film team can throw over the wall to them. Even today in the US it is hard to get ‘talent’ to do specific non-TV elements. I recall twisting many linear producers arms to get talent to do some pieces to camera and how the process was oft slotted in linear production ‘breaks’. Then there was the period when talent sniggered when they said “www dot bbc dot” etc: Now of course the talent take it all very seriously – most of their audience after all are ‘engaging with’ them on that ‘dot’or interactive TV thing. So having strong branded talent on your side is important. You need them to stimulate the audience to move between platforms with great call to actions – get them to say why it is worth their time to ‘tune in’ over there, what’s in it for them, the reward, the importance, why they will be missing out, they are addicted so heres another hit and because they trust you and you say so. More on why and the storytelling element, later. For now back to content production. The same or minor variations of content placed on different platforms in different forms. E.g. : A minor re-edit of the audio from a TV programme for a podcast or a script adapted for a website and in its simplest form exactly the same content delivered on multiple platforms such as mobile, TV and broadband web. The user in this case could create their own cross-media links such as watching half of the episode on mobile and the rest on broadband. This level does not have strong cross-media triggers but may promote the same content on another platform. A good simple example of this is the world first Forget The Rules which was a weekly short form drama delivered simultaneously on TV, Broadband Wed and 3G mobile. This is content produced alongside a main production and delivered on different platforms from the main production. This ‘extra’ cross-media content is naturally different from the main property and not necessarily dependent on it – temporarily or editorially. 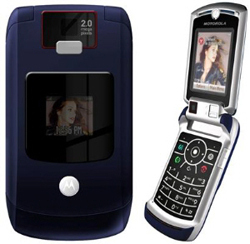 For example it could be a mobile video-captured behind the scenes of a feature film, destined and delivered in segments on the mobile phone. It could be a flash game strongly based on a radio drama or a book back story delivered through posters in train stations. The most obvious incarnation is the ubiquitous ‘making of’ feature that may be delivered only via video web portals. A good recent example is the various transformations of a property called Thursday’s Fictions. This started as a book, turned into a surreal dance film and more recently a Second Life presence created for it. Each version played to the strengths of each platform. The truest form of cross-media where the story or service structure is specifically authored to drive the audience across media devices to continue the journey. The content placed on the other platform is critical to staying in touch with the experience and the narrative bridges tease you towards investigating or moving to another media form/platform. Obvious examples include a TV show that ends suddenly and gives you a URL to explore more. It may be a SMS that teases and points you towards a live concert in a city square which then leads you to a TV show, then to a podcast then to subscription emails. The trigger, or bridge, is the critical component of this in motivating the cross-media action. A very strong example of this is the 30 second Mitsubishi Superbowl 2004 TV ad which showed objects being thrown out of a truck in front of two trailing race cars. It paused on a cliff-hanging moment (as two cars were thrown out) and invited the audience to go to seewhathappens.com. Millions did. An aggregation of the first three levels this is also where the content is distributed across many platforms in a non-linear way and is producer ‘hands-off’- in that they have created an environment, much like a game, that the participant/s ‘lives’ inside of, following their own path and personalizing the experience. A cross-media 4.0 property is co-creative collaborative play with the audience across many devices, which evolves and grows a life of its own. Although likely to be heavily authored the cross-media triggers and invitations are part of the experience in terms of the audience creating their own bridges. The best examples of this are Alternate Reality Games and it incorporates elements of the first three levels but is likely to be dynamic in that producers will have to be constantly bridge building in response to where audiences are travelling. Part of the mix is also what I called Mixed Reality, merged media entertainment and multi-modality – which doesn’t need multiple devices, but utilises multiple media forms in the same place, from many distributed devices back on to ‘one’ device to give a ‘distributed’ entertainment experience in one place. At one end of the spectrum therefore it is a sort of ‘fractured’ CD ROM (yes those mid 90s things that had lots of stuff that you navigated around), a pot pourri of content thrown onto many devices BUT without coarse temporal signposts that break flow and ‘cheapen’ a users journey. At the other end it is something that doesn’t really exist beyond a seed of an idea created by the producer. Perhaps a viral video, or an extremely enigmatic blog. I am avoiding talking about ARG’s here as to me they are a subsection of CM 4.0. A cross-media 4.0 property evolves and grows a life of its own. Where a producer for example writes the first scene, some context and like the process of starting a fire, uses paper, matches, tinder wood, breath, small twigs, large logs and coal – a range of ‘elements’ to build the flame. Requires constant nurturing and that in truth is a content producers role in the future, growing an audience around their property, fanning the flames when required. Not very specific but I will talk more in the techniques section. Right a major problem for producers with cross-media at the moment is with CM3/4 above. If any platform has a dependency, in other words you must view or collaborate with that device/narrative element to continue the journey there is the potential to lose parts of your audience. One sees this all the time. Even though video on mobile or video iPod could be a compelling element, when you say only 5% of the audience may get it, it becomes a nice to have, then eventually a ‘lets forget it’. A shame but that is life. You can throw duplicates onto those devices, but if you cannot make it a necessity then it falls outside of true 360 innovation. This is the really big thorn in 360 production’s side at the moment. Anything outside TV and websites is a potential problem. Physical elements like playing cards or almost ubiquitous SMS can be thrown in but even then if they are critical bridges you may lose audiences who cannot cross it. So most cross media tends to fall into v 1 or 2, because that is the safest, it has elements of brand reinforcement and allows a traditional publish and get on with the next thing, mentality. Even so younger audiences are so 360 savvy that they don’t need to be told when and where to go, they will do it anyway. So CM3.0 is the only way to go for most producers, you have to move your property onto other platforms or you will lose them for completely the opposite reasons ‘ they see you as one dimensional! As for CM4.0 this requires you to be so in-tune and as simultaneous a user as the audience that you effectively become what is referred to as an ‘alpha user’ – a leader of a niche cross-media audience. To some extent you need to be able to ‘live’ the story with your audience and play with it on their terms. If you are not a heavy cross-media user yourself you may not understand their world and no amount of trend analysis will get you there. 1 ‘Fishing for your audience’. This is more a pre main event experience (not that one should consider anything in a true CM world as a main event really), but this is about fishing for audiences across platforms. A poster on the underground, an enigmatic SMS, a viral video on the web, something odd in a TV trailer. They may or may not make direct references to go somewhere or do something else. This is about bait. Garnering interest in your initial creation by having tasty or interesting morsels dangling around the platform environment. Traditional ads and trailers are well too formulaic now for savvy and heavy CM users, they want to be wooed more. 2 ‘Getting them to bite’. This is covered to some extent in a post I did a while ago about immersion and addiction but this is where you have to be clear about what they are going to get. The benefits. This is selling your service. If the service allows them to win money this should be clear, if is about a narrative experience like no other then the ‘teaser’ should have that inherent embedded into it. Doesn’t have to be the gravel voiced film trailer man, but paint a picture of something big (see my scaled points in the above post). If this has been delivered in a viral way consider a phased release of other parts of the puzzle virals with more clarity, as the first viral picks reaches a critical mass and the fish start to swarm. As all good fishermen know patience, timing and knowing the difference between ground bait and hook bait is critical. The lesson here is to surround the potential audience with small fragments of morsels, immerse them in a cross-platform ‘trail mix’. 3 ‘Reeling them in’. They bit and are holding on. So does your property live up to expectations. How do you keep them there? There is so much more bait floating around in this sea of media. Do you open the curtains and reveal all? This is a relationship and like any first, second or third date to reveal everything, warts and all may not be the best tactic. You need to constantly court your audience and give a sense that your service is worth spending more time in. This is where meticulous planning of phased releases of story fragments across the media channels comes into its own. To some extent this is no different from a series editor/writer who has to arc each weeks episode narrative to keep them coming back for more. In a 360 world though it is layered up three or four times and with the disadvantage that audiences are probably viewing your service in a not so ideal order. You need to offer more and more attractive bait and again in my designing experience post in 2 above, you will need to be fleet of foot. 4 ‘Go there for more’. As old as the hills the simple presenter or burnt in signpost url to get more stuff – after, post a main event. Usually seen as an ad or end credit sequence where the voice over tells you why it is worth your while to carry on somewhere else with them. Breaks the fourth wall but is a clear directive. “and over on ABC2”, “read more on the website”, “vote and win prizes by calling this number” and so on. It could be in-story “want to find out what happened to so and so? Go here”. 5 “Parallel Dimension”. There is something on another platform running synchronous to the one you are watching – so treated slightly differently to number 3. The simplest example is when I used to watch cricket. Watch TV while listening to Radio 3 in the UK, because I preferred a more ‘in-depth’ commentary. Now of course there are many other parallel channels. Web, mobile and TV all running along with each other. I am more and more involved with parallels between real and virtual worlds. The techniques to draw audiences into these experiences are often inherent in the service such that if you are on one you can actually see the other one taking place. 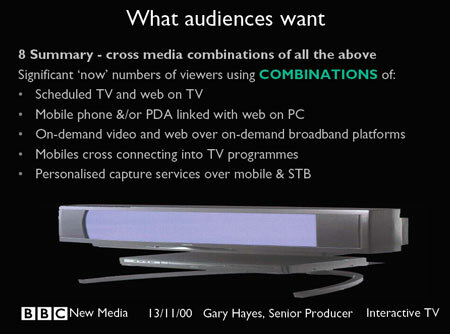 A website in shot on the TV show, a video running inside a virtual space or a TV studio show live on your mobile. If the parallel element is part of your design and services USP then make sure you reference it in both channels. There are some automated systems that will do this for you I talked about in this cross-media trigger post. 6 ‘Storyworld, fishfarm. On their own’. Many refers to CM 4.0 above, but this is where the narrative or just the expectation from the audience that there will be other media elsewhere, drives their journey through the story. The technique here is the hardest to identify but it follows the same technique of designing a physical hunt. You hide things, give not so easy clues and then set the ground rules. Even if you are telling the story of how they used to build Pyramids for example, make the cross-media experience as far as possible deliver something that makes them ‘feel’ like they are a pyramid builder (examples to follow). They will expect something on all platforms and this is where the term 360 or cross-media will eventually become redundant. All properties will have something on all platforms, the same way DVDs now all have extras – or if they don’t they at least pretend to. This all comes back to expectation and trust. If they have enjoyed cross-media experiences from you before they will come back. It is about trust, being consistent and giving them a media world to play in. Cross-media communities, Meaningful 360 examples, Commercial vs public service examples, When cross-media becomes a redundant term. Just got back from leading the third LAMP lab in Perth (there will be more info about the great projects in the lab on the official site over the next few days) and I was also speaking at various multi-platform, digi distribution events – during which I caught up with a couple of NY Times articles on a subject that pervaded all of them – what are the emerging business models or to put it more bluntly “Tell me how to make money with all this new stuff”. A few experts talk at great length about some of the new roads ‘paved with gold’ being laid, for example at Milia I recently posted about in great detail, models as confused as they were bold and optimistic – the fact that digital music is still only around 5% of the market, iPod music around 22 tracks per device (5 videos per device) with on-going Apple favoritism and iTunes store lock-out, then a rather poor 3G video download history worldwide (around 1% of overall revenues – before the telcos eat into it). Firstly I believe no one knows what the most lucrative avenues will be, we are just at the tipping point, and certainly no one knows the models that will truly drive the online on-demand industry forward. The fact that audiences are transitioning and shifting to anytime, anywhere consumption is obvious, so ‘perhaps’ we can get them to pay, somehow. We all know audiences are consuming content from short linear clips, traditional programming, films, virtual worlds and more importantly giving the professionals a run for their money by creating content themselves across a multitude of devices. As the NY Times article “Can TV’s and PC’s Live Together Happily Ever After?” points out, until rights and revenue share models are worked out, we will exist in a ‘trial by error’ market, dominated by entrenched broadcast while fiddling with alternatives that slowly eat into the true on-demand competitor, the DVD market. Just in the last few weeks, for example, Warner Brothers announced it would make hundreds of its hit films and shows available this summer for paid download via the file-sharing site BitTorrent; Fox Entertainment has joined the other major networks on iTunes with downloadable episodes of “24” and “Prison Break”; TiVo announced a deal with the Web video outfit Brightcove that intends to give people with TiVo boxes access to Internet fare on their TV sets; and ABC and CBS have begun streaming replays of some of their most popular shows on their Web sites, offering a new advertising-supported way to tune in. But here is the swirling myth — or is it The Big Lie? — about convergence: It’s not as close as all of that activity suggests. For various reasons, watching TV programs delivered by the Internet on regular TV looks like it will remain tantalizingly out of reach for all but the most enthusiastic gadget junkies for some time. The point of all these new video-content deals being struck by networks and studios is, of course, to avoid making the mistakes of the music industry, which focused too much on rear-guard actions like lawsuits and not enough on figuring out new ways to give the fans what they wanted. The music analogy only goes so far, however. The way music is promoted and sold and listened to bears scant resemblance to TV and video products. Ventures like the one announced by Warner and the big networks are not really an alternative way of receiving conventional TV, but rather an alternative to buying or renting DVD’s coupled with an intriguing new market opportunity to reach viewers on their desktop or mobile devices. Though the studio would not release exact figures, each of the series’ 120 episodes has cost just under $2.5 million to make, for a total of about $300 million. Licensing fees from the Fox Network are not believed to have exceeded $1.3 million an episode, for a total of no more than about $156 million. The rights to broadcast the series internationally have probably been sold for $1 million or more an episode, for a total of at least $120 million. All told, that revenue — about $276 million — has not been sufficient to eliminate the deficit and provide a profit. DVD sales, however, have. “The DVD opportunity on this series has enabled us to produce the show that is on the air,” Ms. Walden said. Over the last year, the Fox studio has also sought to find an audience for “24” and another series, “Prison Break,” through episodes available on cellphones. In the case of “24” — which involved one- or two-minute-long episodes, the first of which did not feature actors from the series — the results have thus far been modest: fewer than one million downloads worldwide, the studio said. and continues with the fact that DVD’s are amazingly the current saviour of the TV industry in that forecast revenues are the only thing allowing big budget TV shows to get made. But opportunities to get that material into ancillary markets much sooner — on DVD, as well as, more recently, via the Web and cellphones — have emerged as potential new sources of revenue for the studios that produce that content. But negotiations over how exactly to get a show to the point that it can be downloaded onto someone’s iPod, for example, have created new tensions between studios and networks, including over how to share the additional revenue. Web revenue is small now, but if it ever approaches the scale of some series on DVD, the prize could be substantial. Consider that the Fox studio has tallied sales of more than $200 million worldwide since the first season of “24” went on sale on DVD in 2002 — more money than the studio had made from the sale of its international broadcast rights and more money than it will likely reap in syndication. The audiences appetite for content when they want it has been known to studios and TV execs for a good while – but I suspect audiences want to ‘own’ content as well and the current mobile, DRM protected broadband files (that stop you moving it around your universe) is slowing progress down considerably, but that is another story. The article continues to echo my original point that no one knows the most effective models (beyond developing your brand at low cost and a handful of others that we keep close to our chests) and I will leave the last word to ABC and Warners in this regard. So there we have it folks, simple, get the fans involved in the story world, not just extending the world with exploratory/puzzle based web quests but actually involved in the construction of the main show plot and your ratings start to escalate (of course involving viewers in the creation of webquest shows is already being done). We are seeing more and more of the “create our ad campaign”, “help design our website”, “draw up our strategy papers” – well probably not the last one directly 😉 But calling out to those who can do (they now have the tools), and can do with passion (they have the inclination) makes so much sense. Well done to Chris and Rob at Showtime! Given that there must have been hundreds of alternative routes generated by this exercise I suddenly realised that we have a great way to generate non-linear narratives here. You know follow this path or this story etc: Showtime have released an eZine with some of these alternatives but hey show creators out there how about a multi-path, or at least a call out for story ideas with character maps/traits, plot structures, so the next phase of dramatic narrative (AI based) has some good raw material – perhaps that is a little too much for the audience at the moment. 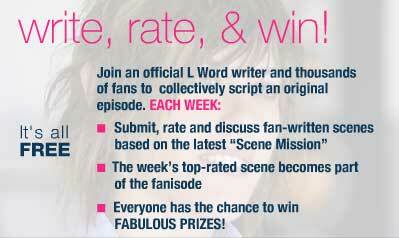 Here is a link to the actual Call to Action website the L Word a ‘fanisode’. Contributors of highly-rated scenes and other winners were featured prominently online during the event, giving them a taste of online fame. Showtime and FanLib will publish a free commemorative eZine (a downloadable digital magazine) featuring the completed script, plus a number of alternative scenes and editorial features including profiles of the winning contributors and other participants. What an incredible journey. After seven exciting rounds, 1,258 scene submissions and over 124,000 votes and 30,000 comments, almost 20,000 L Word fans have collectively created the world’s very first Fanisode. Will talk more on this because it has more far reaching consequences but for now a final word. I think given the subject matter of the programme that ‘fanisode’ may not be the best term to describe this format outside of the US 😉 Just kidding, get trademarking CBS.